← More Great Conics Project News! 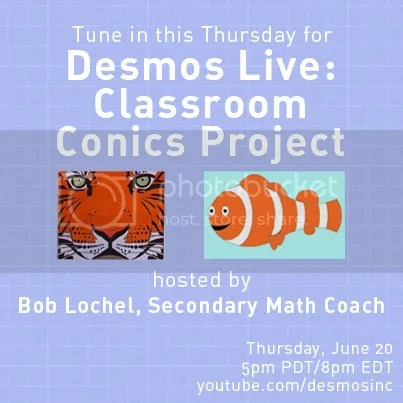 Thursday evening at 8PM EST, June 20, I am looking forward to sharing my Desmos conics project in a webcast. Go to Desmos’ place on YouTube: http://www.youtube.com/desmosinc where you will be able to view the webinar and answer questions. This webinar was rescheduled after some snafus with Google Hangout, which we hope (fingers crossed) will be all ready to go tomorrow. Scroll down to my last post for more info. Have your computer ready to watch, and maybe your iPad handy, as we will walk through a sample drawing. Hope to see you there. What should I wear when broadcasting from my dining room? Suggestions encouraged. This entry was posted in Technology and tagged conic sections, desmos. Bookmark the permalink. If I can’t watch it live, will I be able to view it later?